I’m excited to share this first blog look at the cover of my newest novel, Matthew Makes Strides, which will be released soon. The wonderful artwork by Ken Raney captures the emotion of this intense moment. 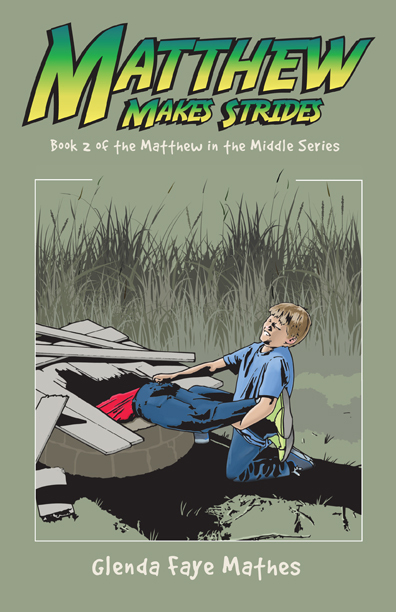 Matthew Makes Strides is the second novel of my Matthew in the Middle series for middle grade readers. Book 1, Matthew Muddles Through, is already available on Amazon. Yesterday I finished the final revision of the final book of the series, Matthew Moves Ahead. It still needs to go through a lengthy editing process, but the Matthew narrative is now—and finally—complete. I spent some time this morning thinking about how Matthew came to be and crafting the story of his birth. My book boy Matthew grew for more years than his age (11) in these novels. He was conceived in a course I took on fiction writing in 2002, as an experiment challenging myself to write in a point of view very different from personal experience. As a boring and sedate old lady, I’d write from the first-person perspective of an imaginative and active young boy. I named that embryo Caleb to reflect the faithfulness and zeal of the biblical believer, who urged the Israelites to fight giants and enter the Promised Land (Numbers 13:30), and who at 85 years of age was still eager to fight for the Lord (Joshua 14:6-12). Military matters interested Caleb, the middle child in a minister’s family, who became acquainted with a Vietnam veteran named Mr. Winters. My book boy continued to develop and was born in 2007 as Matthew Henry Vos. The poor fellow suffered a sickly childhood, undergoing numerous surgeries and lengthy hospitalizations. His debut presentation plans changed from one novel to four to three, and back to four and then to three again (more than once). Matthew made it through some preliminary auditions in 2009 and flew to the big city in 2010 to make a name for himself, but came back home feeling rejected. I visited him from time to time; however, he languished in recovery for years. Well. If my grandson wanted to read Matthew’s story, I ought to finish it before he lost interest. And he was almost a teenager. I determined to put the first book in his hands for his thirteenth birthday. Which I did in 2014. Now the second one is almost ready to be released, and the third one is written. And that’s the story of how my book boy Matthew was born.